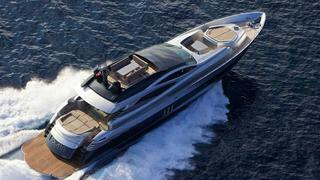 The 27.52 metre Pershing Solaris has been listed for sale with Yachtzoo. The high performance motor yacht was delivered in 2006 and boasts sporting lines and impressive cruising speed of 38 knots, with a top speed of 44 knots. She features a light and bright interior with wooden floors and soft furnishings used throughout her open plan saloon and dining room. The modern and minimalistic feel is carried on throughout her four cabins which offer accommodation for 10 guests. Her spacious master bedroom boasts a walk-in-wardrobe, shower-room and the latest audio-visual equipment. Her VIP cabin is located forward and she offers two additional twin cabins, both with Pullman berths and en-suite facilities. In addition she has space for up to three crew. She was last refitted in 2013 and her deck spaces offer multiple options for cocktails and al fresco dining. Her custom sun deck is one of her stand out features as it has a large private area that can be converted into a dinette for romantic meals. Her aft extends to form a swim platform which is perfect for watersports and allowing younger generations easy access to the water. While her large tender garage offers plenty of space to store the latest must have water toys. Her flexible and family-friendly layout also make her a great option for an owner who is also looking to charter. “Solaris’ impressive leisure and entertainment facilities make her the ideal yacht for socializing, entertaining and a successful charter yacht,” said YachtZoo. Lying in Greece, Solaris is asking €2,600,000 with VAT paid.